We are skipping across the Pacific Ocean at a tad more than 58 mph, running a straight line southeast from Newport Harbor, and in not much time at all we are at Emerald Bay at the very northern tip of Laguna Beach, about four and a half miles from the harbor mouth. 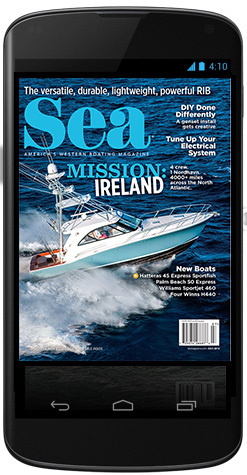 Our chariot is a Tiara Sport 38LS (look for a review in Sea’s December issue) powered by triple Yamaha 350s. While a 38-footer might seem like a sizeable boat for outboard power — heck, it has a cabin and a head — it is but a smallish example of what’s going on in the world of outboard power and outboard-powered boats. Three years ago Mercury put its racing technology into the 400R and brought pro power to recreational boating, and just this year Yamaha cranked things up to 425 hp with a new 5.6L V-8 that’s sure to draw interest from the big-boat center-console folks. Six years ago Seven Marine wowed the crowd with a 557 hp behemoth that has since grown to 577 and 627 hp. It’s clear larger vessels have been in outboard manufacturers’ sights. Even manufacturers that aren’t in the horsepower race have been improving corrosion resistance, finding ways to make engines lighter, increasing their charging capabilities, and making 250 and 300 hp outboards more efficient, quieter and generally better at their job. And now outboards integrate with joystick controls. It didn’t take long for 557s and Mercury 400Rs to start appearing on 40- to 45-foot go-fast center consoles from Intrepid, Regulator, Midnight Express and others. 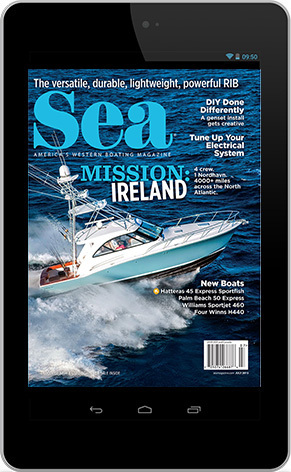 Then HydraSports (now HCB Custom) introduced the 53 Sueños in 2015: a 53-foot center console propelled by outboards. I’ve seen multiple Yamaha and Seven Marine engines hanging off the transom. 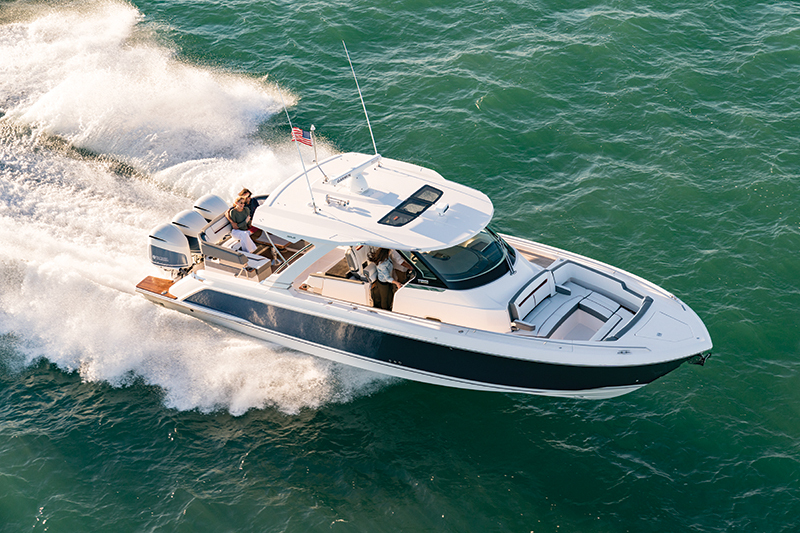 With quad Seven Marine 627s, it can reach 69 mph. Yeah, center consoles and outboards aren’t for everyone but, holy crap, who wouldn’t want to feel that power one time? Well, Sueños’ reign as the largest center console lasted three years, and it was taken down by a stable mate. This year, HCB launched the 65 Estrella. It’s a 65-foot center console, but that’s not the biggest part of the story. 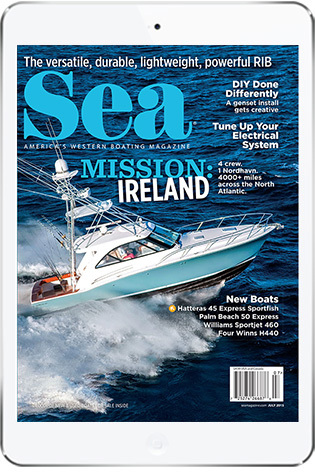 Estrella (read more about it in December’s West Coast Focus) is powered by outboards: five of the 627s on hull #1. My smartphone’s calculator tells me that is a total of 3,135 hp. I haven’t seen a top speed for Estrella yet, but on a 65-footer it’s less about blazing top speed than it is about consistently reliable power. Scout Boats and Boston Whaler have 42-footers. Everglades has a 43-footer. Grady-White has a 46-footer. All are powered with outboards — multiple outboards. Why do I bring this up? Outboards aren’t going to replace inboards or sterndrives, but their use on larger vessels is a notable trend that isn’t limited to a small segment of the boatbuilding world anymore. Heck, the Estrella might be a center console but it has eight feet of headroom belowdecks and can sleep five people.